Baby Tea Is Available For Adoption! TEA AVAILABLE IN CAUCASIAN, DARK AND LIGHT BI-RACIAL SKIN COLORS! Tasha does a wonderful job of micro rooting the hair. Just take a look at the bi racial Layla hair. It looks so natural. 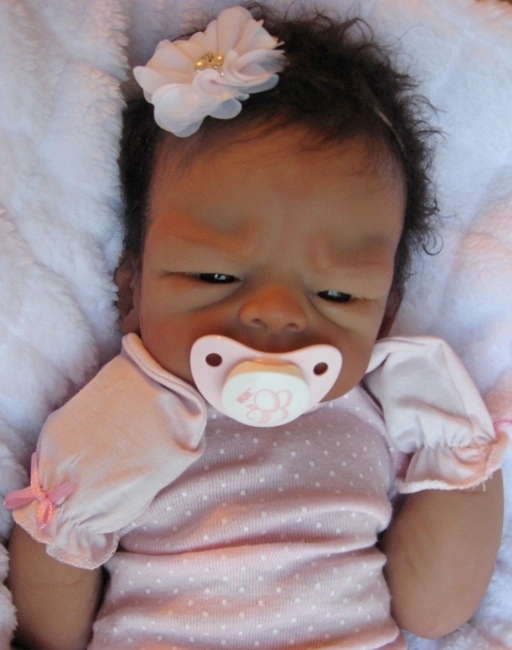 NEWS DECEMBER 1, 2015: TEA IS TENLEIGH'S IDENTICAL TWIN SISTER THAT IS A FULL BODY SILICONE BABY GIRL! 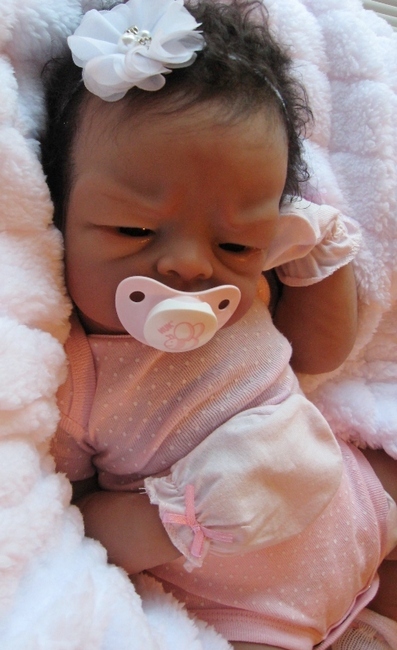 ALSO TIANN HAS AN IDENTICAL TWIN BROTHER NAMED TRISTEN THAT IS A FULL BODY SILICONE BABY BOY. 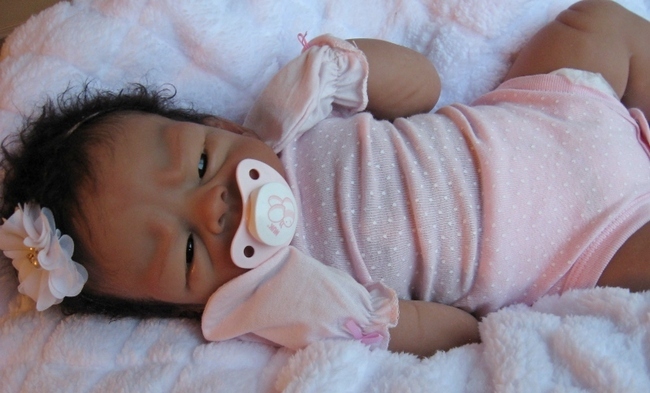 SURI IS SOPHIE'S IDENTICAL TWIN SISTER THAT IS A FULL BODY SILICONE BABY GIRL. ORDER ONE OR ALL. AGAIN, ALL ARE AVAILABLE IN CAUCASIAN, DARK AND LIGHT BI-RACIAL SKIN COLORS! Baby Tea. 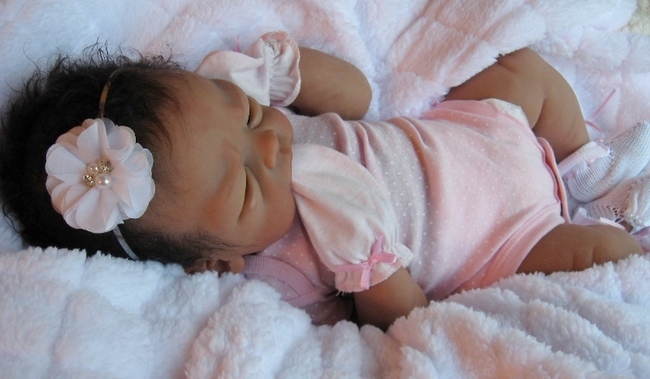 She is a full size newborn baby girl measuring approx 19 inches in length. Tea is the twin of Tenleigh and Tiaan. Tea is cast in super soft and flexible Platinum silicone, Ecoflex 20. 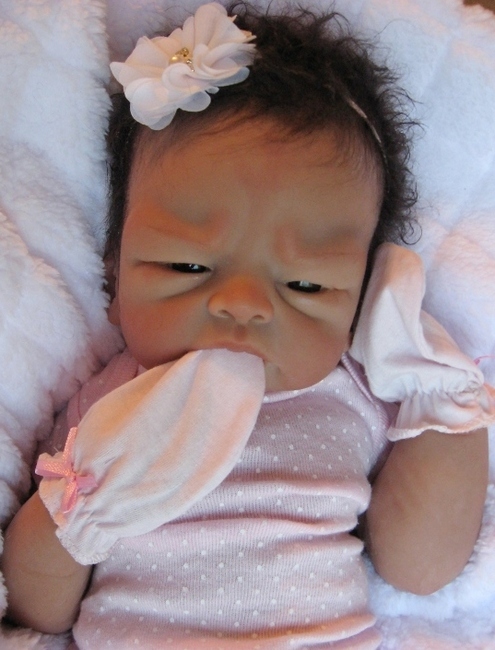 She is a full body solid silicone baby. 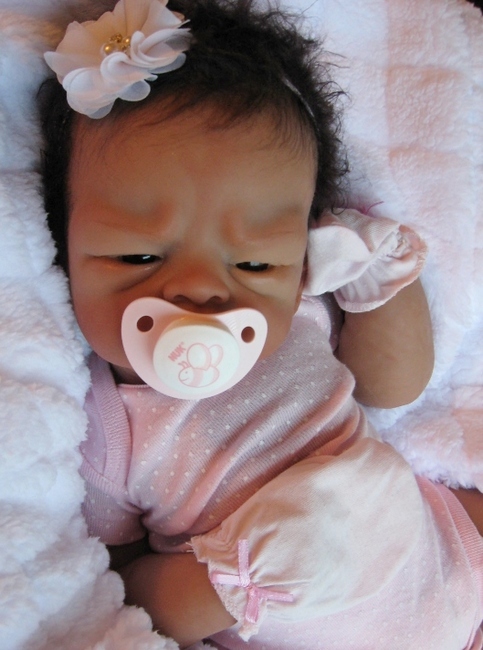 Tea has an open-mouth which enables her to take a newborn pacifier. Tea comes in your choice of eye color, hair color and rooting density. Tea comes in the outfit shown as long as available. 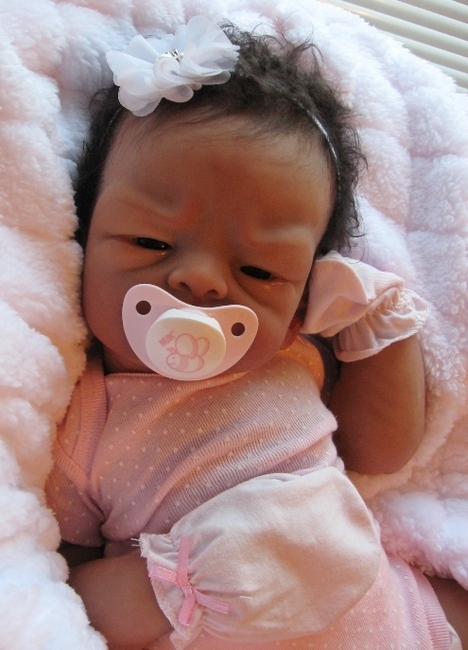 She will also come with hand mitts, a modified pacifier, a blanket and birth certificate. Tea weighs about 10 to 10.5 lbs. Special Doll Connection Price: $1,999.00. Call Ann at 866-817-0795 (toll free). Click OrderOnline to order online now. Layaway and shipping available worldwide. These babies are exclusive to the Doll Connection Store! Note: The stuffed animal is a prop only and is not included. For more pictures, click on Tiaan since he is her identical twin. The Tea below is in the dark bi-racial skin color.